Nothctop Mountain catches the Sun's first rays of the day as the peak is refelected in Lake Helene. 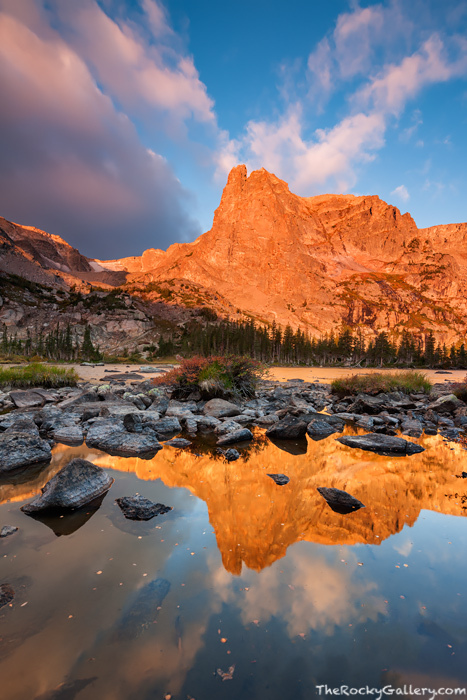 Notchtop Mountain is one of Rocky Mountain National Park's most recognizable peaks and Lake Helene does a great job framing the mountain in a classic Colorado scene. It's a 3 mile hike from the Bear Lake trailhead to reach Lake Helene and take in this view of Notchtop. Photo © copyright by Thomas Mangan.